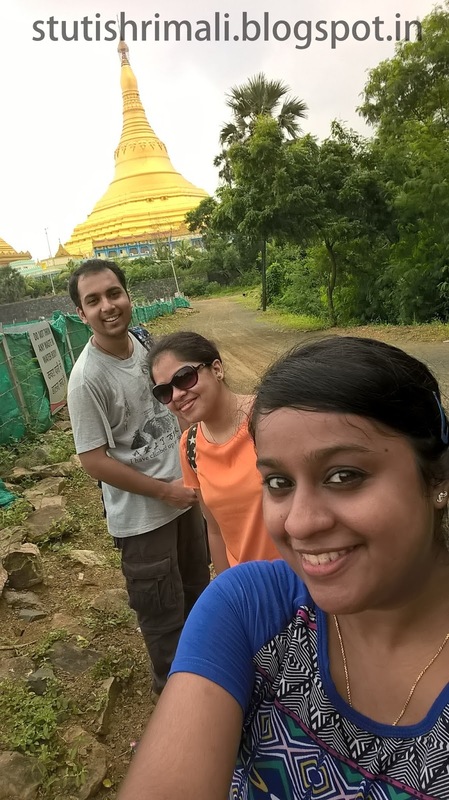 Global Vipassana Pagoda is a majestic construction by the Gorai Creek in North Mumbai. Where you reach via the peaceful water to attain solace. It is a meditation center built out of gratitude to Lord Buddha, the epitome of peace, dyaana, truth, brotherhood, containment and above all enlightenment. Inaugurated on 08th February 2009, it contains the world's largest stone dome without any pillars to support the structure. It's a traditional Burmese design, constructed like the Shwedagon Pagoda in Yangon (Myanmar aka Burma) but combining both ancient Indian and modern technology. I visited this magnificent place this month with my friends. I always wanted to come here as I was mesmerized the structure. My love for something new, different, charming and that too in buildings never die. Left early morning from my place (quite far) to reach Borivali from where it is not too far. We reached Borivali station and from west we took an auto to Gorai Creek which is around 7 km. From Gorai creek we took ferry to the Essel World (around 15 min ride) its Rs.50 for a return ticket. Walking distance from the Essel world jetty you are about to unleash the great work of people who united to give you Pagoda. Meanwhile we also went to the meditation center where we sat for 10 min of meditation. After exploring this beautiful place we went for some pet pooja. There is a canteen in the premises it self with a good menu. There you can buy souvenirs too and explore the section with wall mountings. I found souvenirs a bit costly but if you really wanna buy something do go for key rings or CDs and books. We bid adieu to this milestone of Mumbai with a beautiful view on our way back home. 3. Food Court is there. 5. Visit their website for more info. Where is the Buddha Statue and loved the last click! Hehe... The statue was outside canteen when you take a left towards exit. I have been here. The views are amazing. I would like to enroll for a meditation course here. I have heard it's healing. The aura and air itself is healing. Such a peaceful place.